Everyone seems to be on top of their organization game this year, which is why you need effective storage solutions that fit your family’s needs and your budget. After all, Marie Kondo-ing your house means nothing if you can’t keep it organized. Luckily, Honey Can Do offers a plethora of home, office, and playroom storage solutions that are easy, affordable, and will help keep you organized long after you’ve given up on folding your toddlers pants into neat little rolls. For no-excuses putting away of their most beloved shoes, get the Bamboo Entry Way Storage and Shoe Bench. The Over the Door Hanging Shoe Organizer is perfect for the hallway closet door for the extra shoes that aren’t used as often. 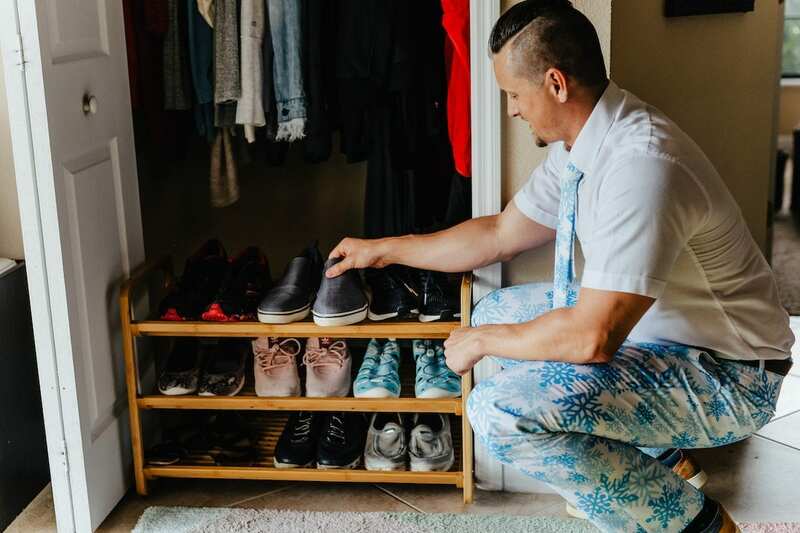 And then stick a couple of the 4-Tier Hanging Shoe Racks in each person’s closet for the seasonal or super nice shoes that are only used on occasion. Like most families, you probably have one place in the house where you store most of your stuff – the garage. It is a large open space that can hold many things but the problem is that it gets messy and overwhelming without any real organization. These storage solutions from Honey Can Do will help keep your garage organized all year long so you can actually find your wrapping paper and your child’s bike helmet with ease. With all those after school activities and sports, you need a place for all the equipment like this Sports Equipment Storage Shelving Unit. An additional shelving unit like this one is perfect for tools and smaller items like games, seasonal storage containers, and more. Keep all the gardening shoes outside and off the ground with the wall mount shoe warmer, and all the wet, snowy winter coats and gear out to dry with the portable warming closet. Getting stuff off the floor is a great way to keep your house feeling organized and minimalist. 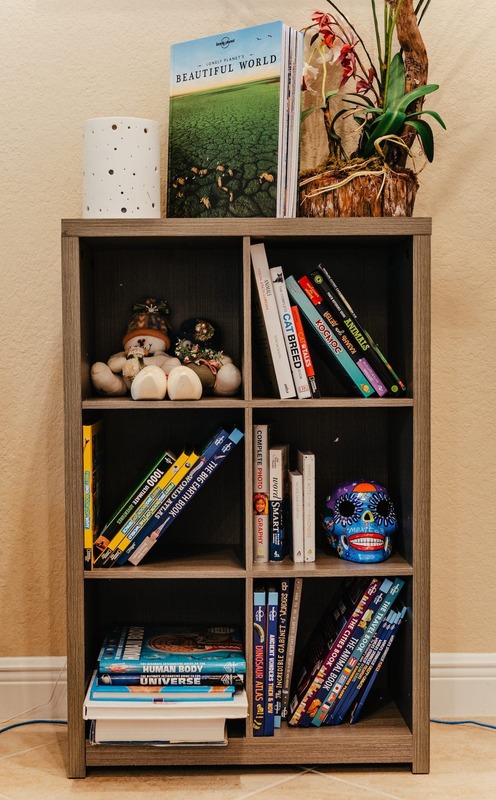 Storage cubicle shelves can work in so many different capacities that it is smart to have a few in different areas of the home such as the kids rooms, playrooms, a hallway closet, and even the home office to keep things up and away under you need them. This 9-Cube Laminate Storage shelf looks great and hides anything you need to hide (like toys) in cute fabric bins. This bamboo shelf has hooks for coats, leashes, and keys making sure everyone from the adults to the animals have their stuff in one place. Add a 5-tier wire storage self to your pantry or your hallway closet for extra storage, too. Every family has leftovers but storing them in plastic containers isn’t exactly the best way to go. Plastic is made with chemicals and by-products that can leak into the food, especially when heated in the microwave. Keep everyone safe with these glass food storage containers. Keep all your food air tight and safe with the Vac n Save regular set- and with 17 pieces it has plenty of size options. For on-the-go use, the Snap-Lock Food Storage containers come in a variety of sizes which makes them perfect for lunch boxes. 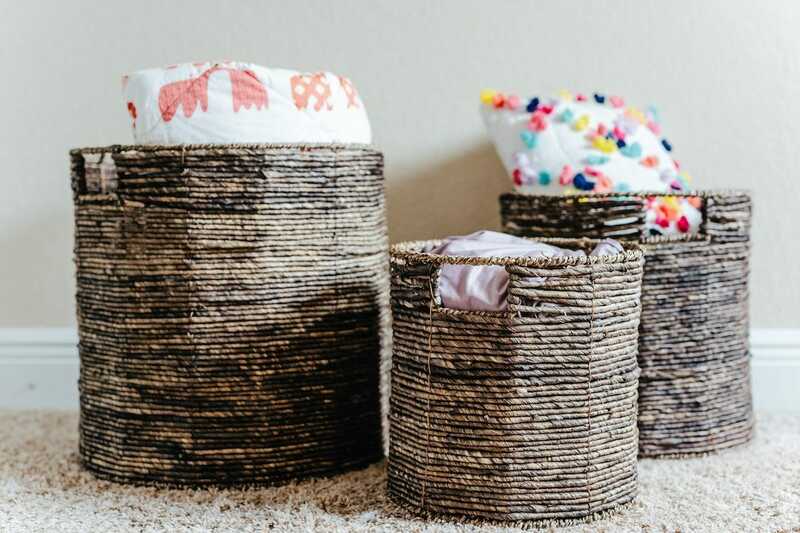 Baskets are the perfect catch-all for all the stuffed animals, toys, and blankets in your child’s playroom. Toy storage organizers with fabric bins and book baskets where your kids can easily see and access their toys (and maybe even clean them up a little more easily) are perfect for the playroom. Looking for more tips on organizing your playroom? Check out these 6 Awesome Tips for Keeping Your Playroom Organized. Kitchens are where your family spends most of their time, and it is the place where you come together for meals and bonding. It can be hard to keep your kitchen organized when it becomes the catchall for all the papers and school items, but these simple kitchen storage solutions will keep your counters clear and have you feeling happy every time you go to make a meal. Make much needed space in your cabinets with this corner organizer. Perfect for dishes or food items, it adds precious real estate where you need it most. A magnetic spice rack gives your counter and cabinets space and let’s you grab what you need as you cook. And keep all those fresh herbs preserved with a glass herb preserver. How many of us have a pile of earrings, necklaces, and bracelets sitting on our bedside table or bathroom counters? Get more use out of your jewelry and be more likely to wear it with these jewelry organizers that allow you to see all your favorite pieces as you get ready in the morning. Depending on how you get ready in the morning and how much jewelry you have will determine what type of organizer best suits your family. Honey Can Do offers a dresser top one, an over the door option, as well as a free standing jewelry organizer. Your home office contains all of your important documents and, for many of us, is also our actual work space. Keeping your workspace organized is key to a productive day, and these office storage solutions will help you keep everything safe and where you need it without making your home office look too stuffy. Your desk is your catch all but with this organizer set you will be able to catch it all in perfectly neat sections. Keep all your important files safe with a mesh file organizer, and add a couple of nesting baskets for any extra materials you may need throughout the day (also great for storing snacks- just saying). Work from anywhere in the house with this laptop desk, too. And make your office feel extra homey with this wall mounted planter. It is a wonder that our family has any clothes in the closet when it seems like they all take up residence in the laundry room. Piles of laundry just look exhausting but with these easy laundry room storage solutions you might find that it will soon be your favorite room in the house (that might also have to do with the fact that you actually get to be alone in there (after all who really wants to do laundry), but hey, we don’t judge). Give everyone their own hamper and start teaching the kids how to do their own laundry from an early age. Make laundry easy when it comes time to actually do it with this laundry sorter. Take care of your delicates with a drying rack. Or if you have lots of clothes that need to be hung to dry, you may want to upgrade to a garment rack. Looking under your bathroom cabinets can be the stuff of nightmares. Trying to find shampoo that you are sure you bought on your last Target run or finding that long lost curling iron is a battle no one really wants to fight. 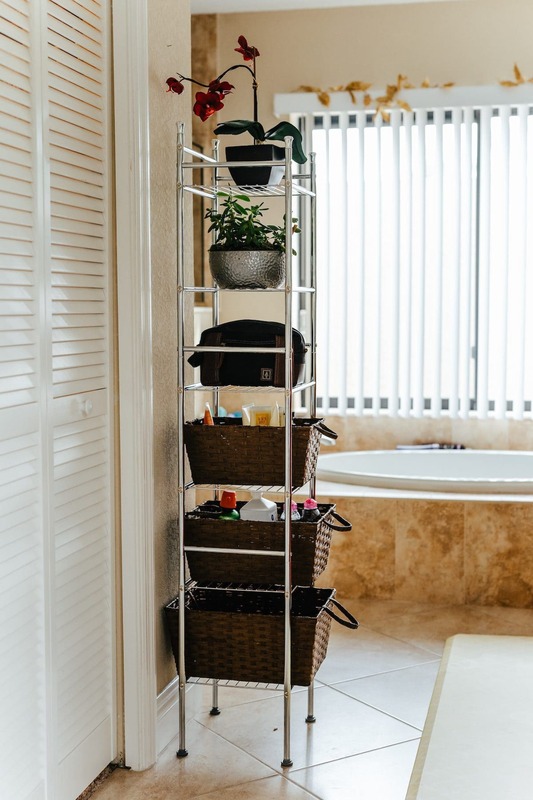 Keep everything neat, tidy and organized with bathroom storage solutions like these. Keep everything neat and tidy with these wicker baskets and 6-tier shelving unit. Make bath time even more amazing with this Bamboo Bath caddy (complete with a spot for your wine glass) and this bamboo bath towel storage unit. Keep your counters clean with this bamboo bathroom set for your toothbrush, soap, and more. Marie Kondo told you to roll every single one of your toddlers shirts and pants into neat, easy to see rolls, but you’re “I’m going to do it myself!” threenager quickly made sure that all your efforts were for naught. Here are some clothing storage solutions that your whole family can stick to. Keep your shoes all in a row with this easy to access hanging shoe and boot organizer. Save room in your closet with this pant and skirt hanger and use baskets and bins in your drawers to make staying organized even easier. Or just create a whole new closet with this freestanding closet rack. Your attic is the one place that no one wants to go, but you might after getting it organized with some of these attic storage solutions! You can keep your seasonal items together and easy to find, as well as store all those family relics you are hoping to continue to pass down for generations. Clear faced bins allow you to easily see what’s inside your stored goods without having to open everything up. Vacuum-sealed storage bags allow you to easily store bulky items without taking up too much space (and saving them from moth balls and mold). One or two tiered storage racks will help give you a little extra space as well. If your child loves LEGOs, you not only know how expensive they are but also how messy they can get. Children love to dump their LEGOs out to find that one piece they are looking for, but cleaning up isn’t so fun. With these LEGO storage solutions, you can help reduce the dumping and make cleanup even easier. An open faced toy storage unit like this one makes it easy to see all the lego pieces you have. Sorted by color or shape your child will be able to easily find what they are looking for without dumping. A cart with drawers is another great option for all the pieces, especially if your short on space. If you just need some extra bins to clean up those pieces, get a few fabric ones to make it simple and look nice. And then protect all those pieces they worked so hard on from little siblings’ hands with a couple of floating shelves for display. See more LEGO storage solutions here. 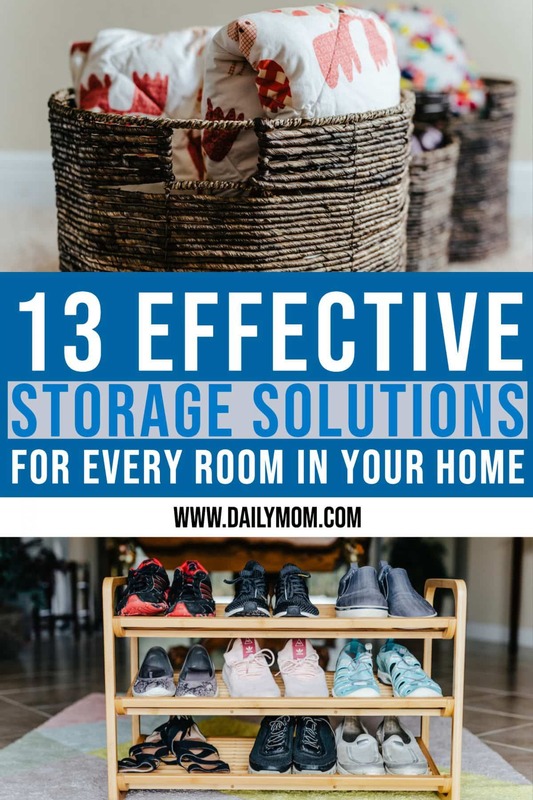 Trying to keep your house organized can be easy- as long as you have some easy to use and effective storage solutions that the whole family can use. Honey Can Do has storage solutions for every single room and every single thing in your house, so the next time you watch Marie Kondo on Netflix you won’t be tempted to throw out the baby with the bath water because when everything has a place, it will bring you joy. Check out this article on 5 Tips for Organizing Your Playroom.